Shirts With Random Triangles: Is Jon Gruden Supporting Tennessee, Or Trolling It? Is Jon Gruden Supporting Tennessee, Or Trolling It? 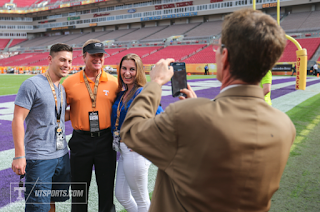 Tennessee Athletics Photography tweeted out this photo of Monday Night Football analyst Jon Gruden "offering his subtle support" to the Tennessee football program by donning a Tennessee polo shirt while touring Raymond James Stadium, host of the 2016 Outback Bowl. What Tennessee calls "support," is I call trolling. There's always at least one rumor about the Vols hiring Gruden as its new head coach when the position either comes open or is rumored to come open. Chucky donning a Tennessee polo to make the Vol Nation freak out is definitely not below him. Tennessee faces Northwestern in the 2016 Outback Bowl today at Noon on ESPN.